The Saint Paul Chamber Orchestra performs this week with one of their artistic partners, violinist Patricia Kopatchinskaja. She leads a program that explores the mystery behind various incomplete musical fragments as well as music from their Grammy-winning album, Schubert's Death and the Maiden Quartet. When the Grammy was announced earlier this year, here's how Kopatchinskaja responded: "In March 2015 with the wonderful Saint Paul Chamber Orchestra, we had the chance to explore Schubert's quartet Death and the Maiden in a multifaceted project. We began with Normiger's Toden Tanz followed by an ancient Byzantine chant of Psalm 140: 'Lord, I have cried unto thee, hear me.' To illustrate the Pavan in Schubert's 2nd movement, we also played one of Dowland's Pavanes from Seaven Teares. Add to this Moro lasso, a madrigal about death by the famous Renaissance composer (and murderer!) Carlo Gesualdo. Before the Finale, we refresh our ears with unsettling works by one of the greatest living composers, Gyorgy Kurtag. This project with SPCO enlarged our dimensions of hearing and together we approached the music as a soloist would, individually, but all souls mystically linked to an intuitive whole that does not need a conductor. I am looking forward to our future experiences and my heartfelt thanks go to all the musicians and staff of the SPCO for their enthusiastic support and to Bruce Coppock [former President and Managing Director of the SPCO] who made all this possible." Classical MPR's midday host, Alison Young, hosts the pre-concert "Fanfare" talks at the SPCO Friday, May 4, and Saturday, May 5, at 7:00. For more information, visit the Saint Paul Chamber Orchestra's official website. 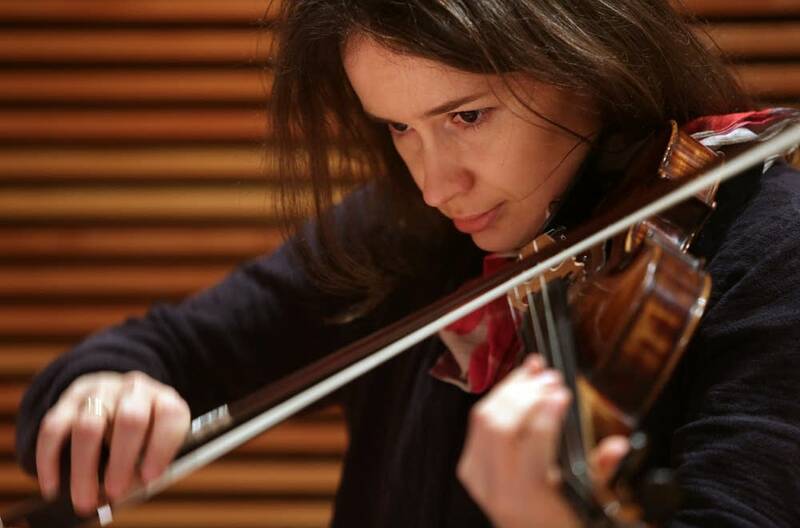 Classical MPR's Julie Amacher recently spoke with Kopatchinskaja about the recording and about her experiences creating this program with the SPCO.